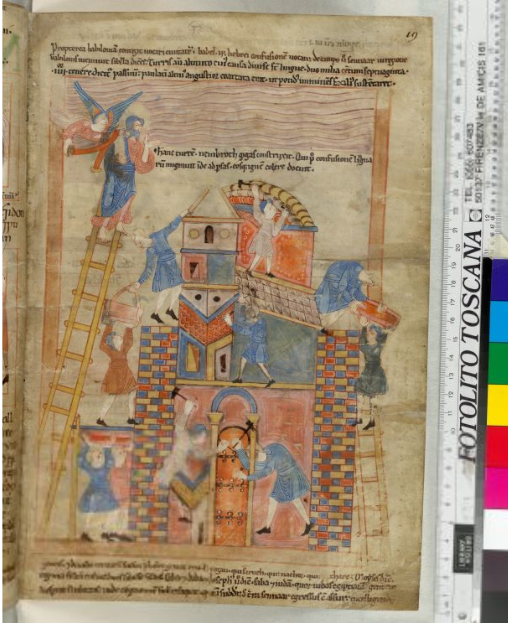 Too often, we had observed, illustrations from manuscripts found their way into publications with accompanying texts and captions having little recognition of the complexity which the visual evidence might carry. 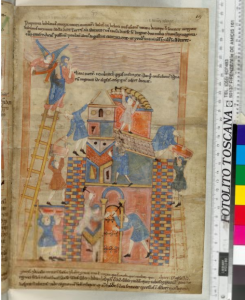 Not necessarily could images from the “troves” of extensively illustrated manuscripts serve the appointed purposes, given a clearer awareness of the characteristics, or degrees of “veracity”, which those images possess. 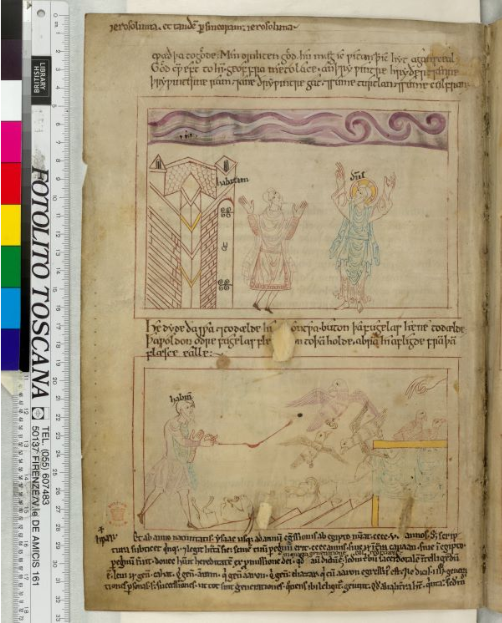 For example, however “convincing” or tempting, the scenes in some Anglo-Saxon manuscripts of the Psychomachia by the 5th-century Spanish poet Prudentius might be as illustrations for Anglo-Saxon life, it is worth knowing that those manuscripts derive, by definition, from earlier manuscripts, and that some of the surviving manuscripts made in Continental centers show very similar objects, costumes, hairstyles, gestures, buildings, weapons, and drinking vessels. © The British Library Board, Cotton MS Claudius B IV, folio 31v: Genesis 19:3‒13. Reproduced by permission. Seated around the reading table of the Library, the members of the Seminar could directly examine some manuscripts in the Library’s collection and some facsimiles of others. Thus, for example, we could compare Corpus MS 23, Part I, and its Psychomachia, skillfully illustrated with coloured-outline drawings, with the monochrome plates printed in the monumental publication of Die illustrierten prudentius-Handschriften by Richard Stettiner (1905); and with the printed facsimiles edited respectively by Israel Gollancz (1927) of the Caedmon Manuscript of Old English Poetry (Oxford, Bodleian Library, Junius MS 11); by C.R. Dodwell and Peter Clemoes (1974) of the Illustrated Old English Hexateuch (London, British Library, Cotton MS Claudius B IV); and by M.R. James (1935) of the Eadwine Psalter (Cambridge, Trinity College, MS R.17.1). © The British Library Board, Cotton MS Claudius B IV, folio 13v: Genesis 6:12‒22. Reproduced by permission. 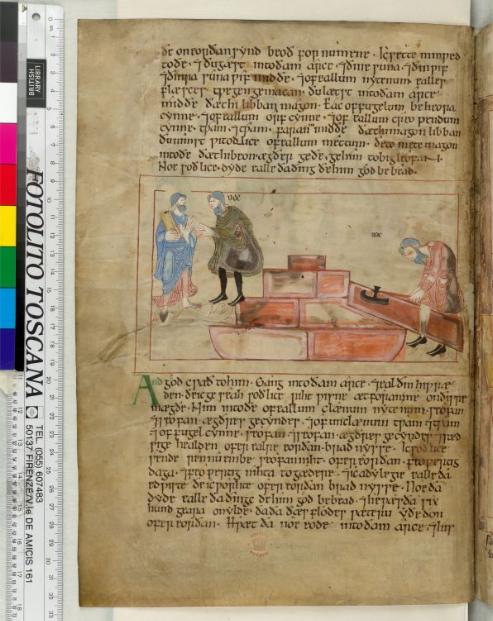 MS 389, with its partly finished frontispiece figures of scribe, author, and king, plus scribal implements, hangings (that is, curtains, in the literal rather than the figurative sense), throne, and edifice. 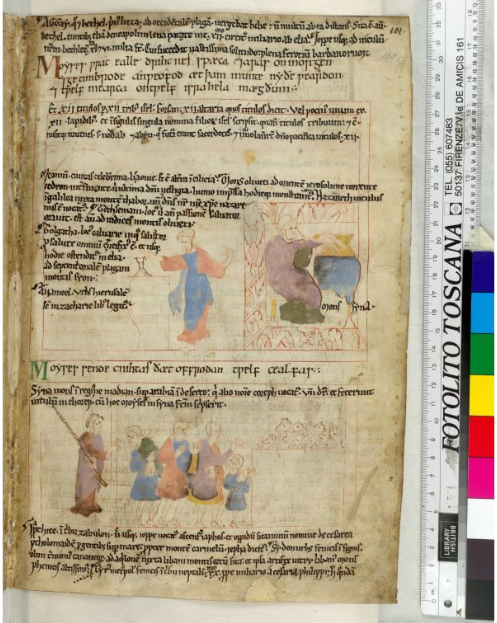 Other manuscripts, too, brought to the table, revealed their flyleaf sketches, scribbles, and drawings of elements, finished or unfinished, which related to our theme. © The British Library Board, Cotton MS Claudius B IV, folio 26v: Genesis 15:10‒11. Reproduced by permission. Reproduced by permission. Needless, perhaps, to say, given the gathering, frequent mention was made of artefacts, weapons, jewelry, and vessels of various kinds known from archaeological excavations (Sutton Hoo and its Ship Burial notably included). It was agreed that the experience of collective examination of the evidence, in the company of relevant expertise in diverse fields, was worth repeating. © The British Library Board, Cotton MS Claudius B IV, folio 100r: Exodus 24:4‒ 5. Reproduced by permission. And so was launched the vigorous series of Seminars, plus some Workshops, which took place at frequent intervals for the next few years at the Parker Library, with some held in other centers in England and Japan. 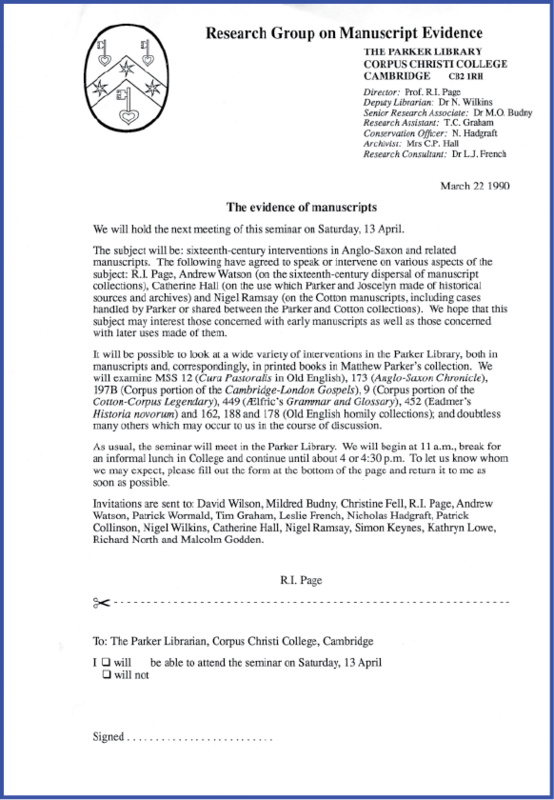 Soon, the series took the theme of “The Evidence of Manuscripts”, partly as the Research Group on Manuscript Evidence itself took shape, designed its logo, chose its name, created its letterhead, and acquired momentum with “resident” members and Associates from elsewhere (whose names appeared on the footer of our letterhead, in increasing numbers). 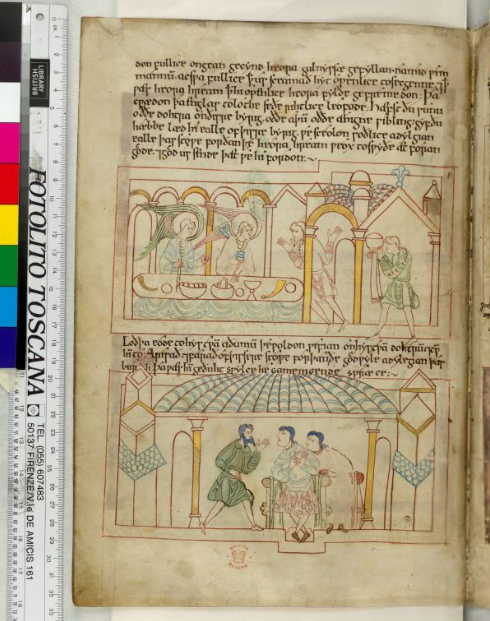 Now, for our upgraded website, we present illustrated Reports of the full set, as each of these events in the Series of Seminars on the Evidence of Manuscripts finds a place of its own. 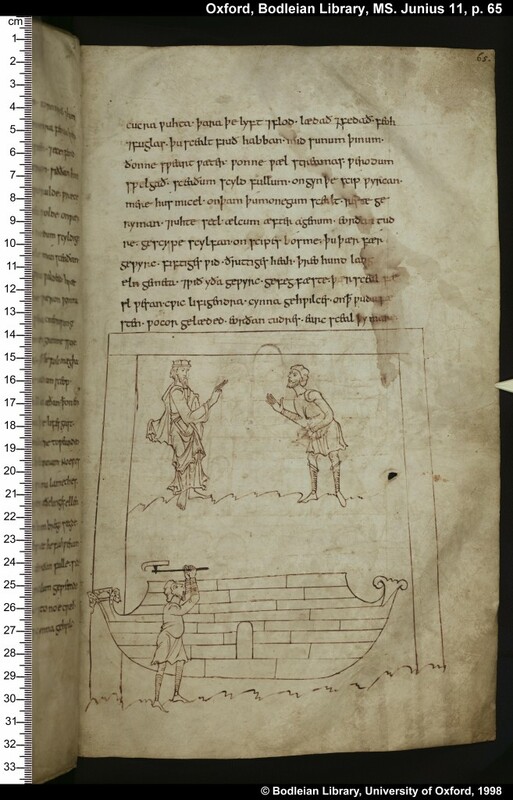 ‘The Caedmon Manuscript’, Junius MS 11, page 53, circa AD 1000. Photo: © Bodleian Library, University of Oxford (1998). 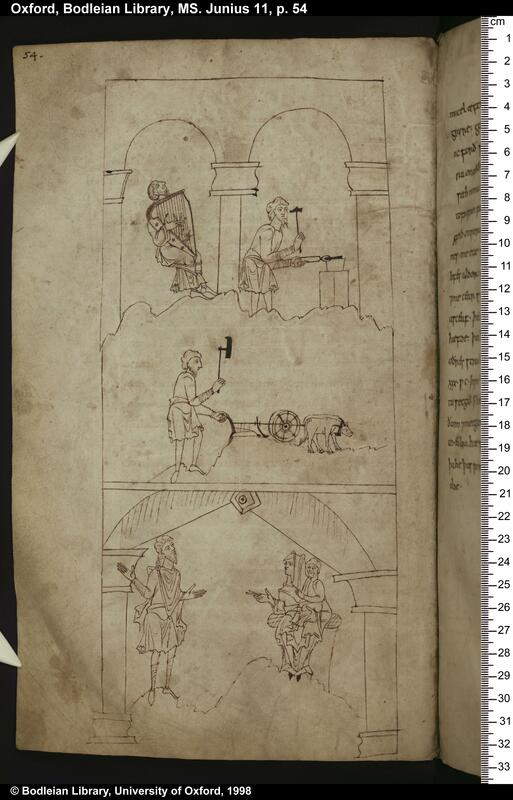 ‘The Caedmon Manuscript’, Junius MS 11, page 54, circa AD 1000. 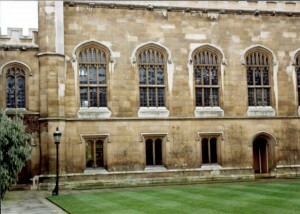 Photo: © Bodleian Library, University of Oxford (1998). ‘The Caedmon Manuscript’, Junius MS 11, page 65, circa AD 1000. Photo: © Bodleian Library, University of Oxford (1998). Pick your Subject. To do with Manuscripts, of course. 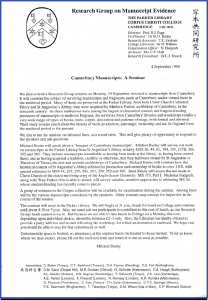 (We were researching manuscripts full-time, intensely and collaboratively, so subjects abounded.) Think of People working on It or interested in It. (By definition, It is a Good Thing.) Choose a date and place. Send out invitations. (Don’t forget lunch.) Set out the manuscripts for inspection and consultation. (Or, in other places, bring photographs, usually in the form of an exhibition.) Start talking. (Don’t forget to listen as well.) Ask and answer questions. Pose more questions. Refine the quest. Have another look. Repeat. Bringing scholars and students together to look at the books, consider their challenges, confer about the questions, reconsider the materials in the light of new or reviewed evidence, and recognize the advances in knowledge, new questions included — this experience could enlarge understanding and refresh the quest for further exploration. 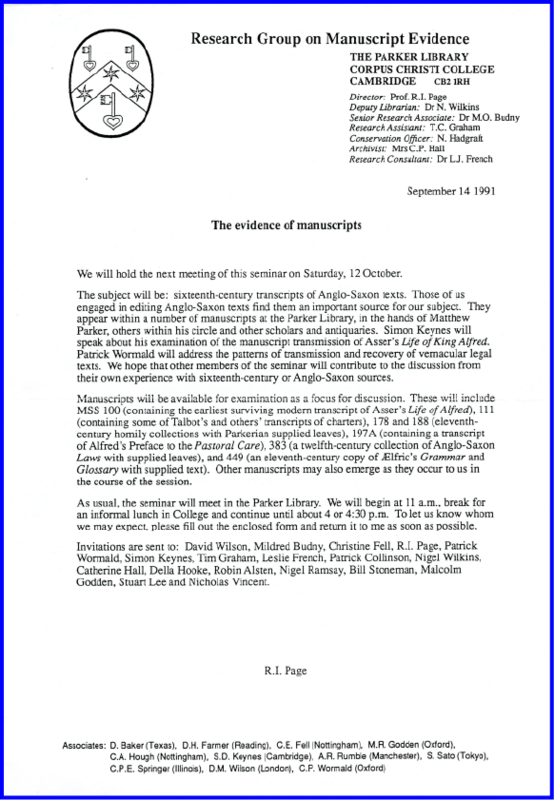 The Archives of the Research Group on Manuscript Evidence, based in Princeton, New Jersey, since October 1994, preserve some records of this full Series of Seminars and Workshops. Most were called “Seminars”, but some were called “Workshops”. All proceeded by Invitation, almost always in the form of a collective Letter, almost always generated by word-processing and laser-printed or photocopied for circulation. The text of the Letters usually occupies a single page, although some extent onto a second page. 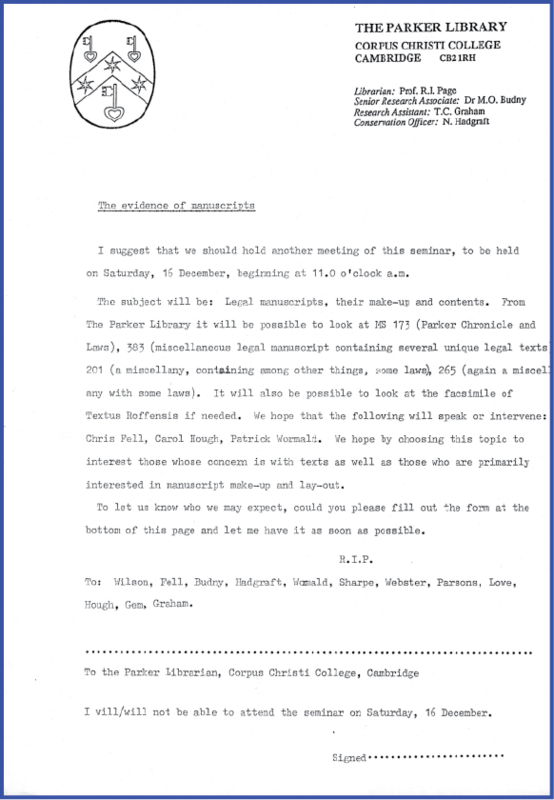 The Archive preserves the dot-matrix-printed “original”, sometimes with proof-corrections, for a few of the Invitation Letters, to be printed out on the letterhead. The letterhead itself varied over time, with the addition of names. Usually the Letters include RSVP slips or full-page forms. 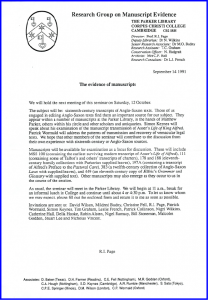 The Archive retains the responses for some of the Seminars, with the signatures and sometimes also with comments by the respondents. It is noticeable that the full-page versions of the RSVP forms encouraged the addition of comments, extending them partly into the realms of correspondence. 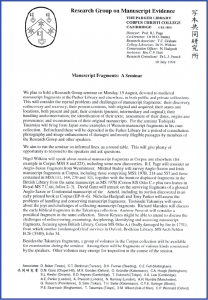 The Archive also preserves some letters or cards which precede or follow a given Seminar, copies of the handouts which accompanied some Seminars, notes and outlines relating to the subjects, planning, and manuscripts for display. For a few Seminars there are handwritten Reports or “Minutes” prepared during the event. 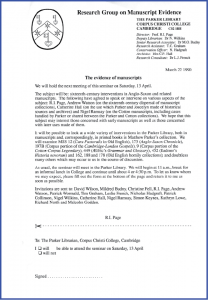 “Legal Manuscripts, Their Make-Up and Contents”. That December meeting was the first Seminar in the Series to occur during the tenure of the Leverhulme Trust Research Project. 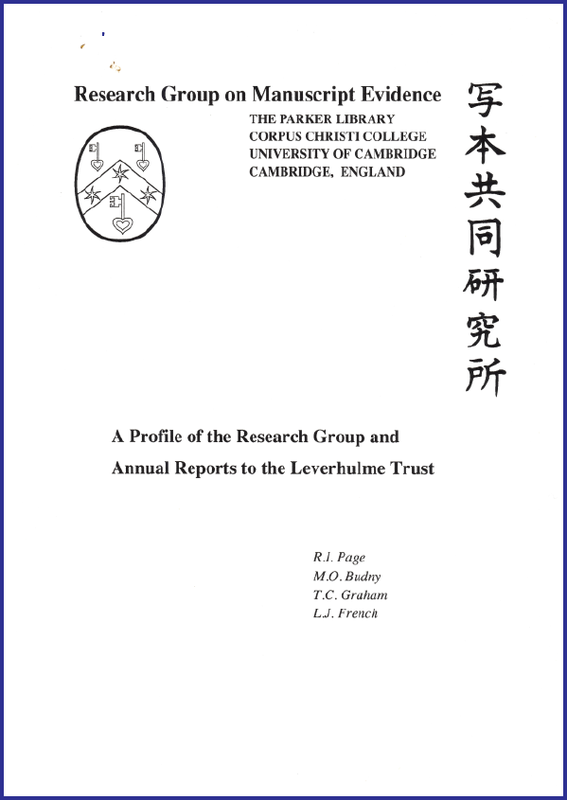 Reports of the Seminars from that time forward appeared in the Annual Reports to the Leverhulme Trust, listed in our Publications. Therefore, given that timeframe and set of obligations, this very Post (You Are Here) presents the first published report of the First Seminar, which turned into the first of a whole Series. 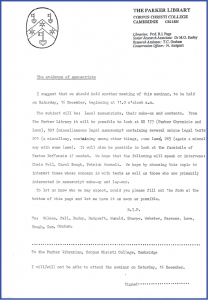 The Research Group Archives contain the handwritten Reports, in the form of Minutes or outlined Minutes, for several of the Seminars, as mentioned in their individual posts on this site. © The British Library Board, Cotton MS Claudius B IV, folio 19r: Genesis 11:5. Reproduced by permission. Over time, there accumulated a collective body of enhanced knowledge, including in-house knowledge, grounded upon close and long-term observation of the evidence of the manuscripts and their contexts. An important part of that growth resided in, and resulted from, the intensive series of Seminars and Workshops which accompanied the full-time research work, advised by many experts both on site and in other sites, conferences included. 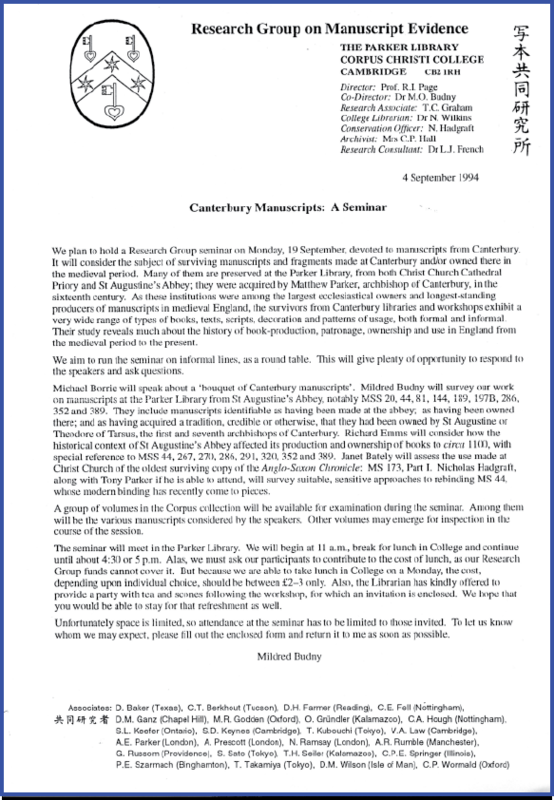 By 1992, the Research Group on Manuscript Evidence began its preparations to sponsor its own Sessions at the Annual International Congress on Medieval Studies (which Mildred Budny had attended since the mid-1980s), starting with the 1993‒1995 Congresses. By such means, including the presentations, Photographic Exhibitions, and discussions as part of these multiple Congress Activities, it was possible both to disseminate knowledge about the research work, its progress, and its discoveries, and to gather feedback for enhancing and promoting that process. 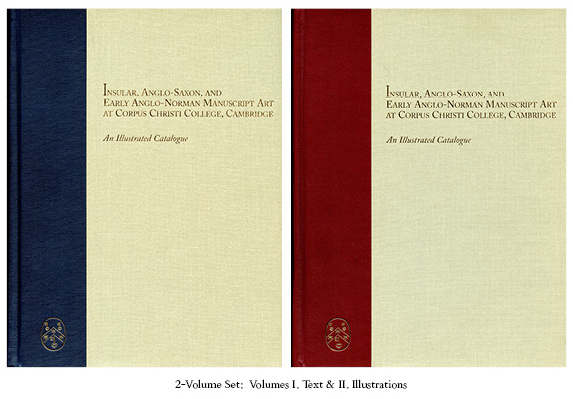 In time, many results from such collaborative research and generous feedback could be reported in the co-publication of the 2-volume Illustrated Catalogue of Insular, Anglo-Saxon, and Early Anglo-Norman Manuscript Art at Corpus Christi College, Cambridge (1997) by Mildred Budny. It is no accident that MS 23, Part I, occupies the lioness’s share of this Illustrated Catalogue. You, too, might have your very own copy of the Illustrated Catalogue. 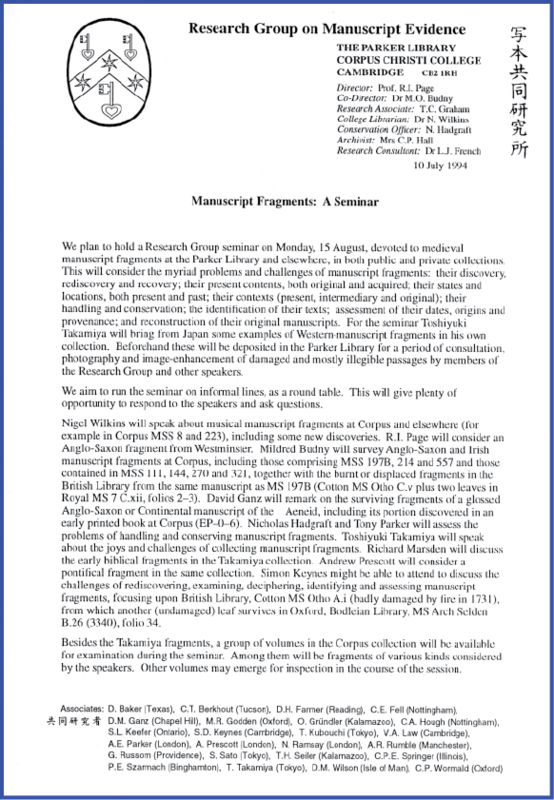 We invite you to consider the special Promotional Offer for the set of volumes, now that its distribution has been transferred to the Research Group on Manuscript Evidence, following changes in Direction at the catalogue’s co-publisher, Medieval Institute Publications. With the companion volumes of Text and Plates, designed as a pair, you might turn the pages, comparing text and image as they unfold across time and space. 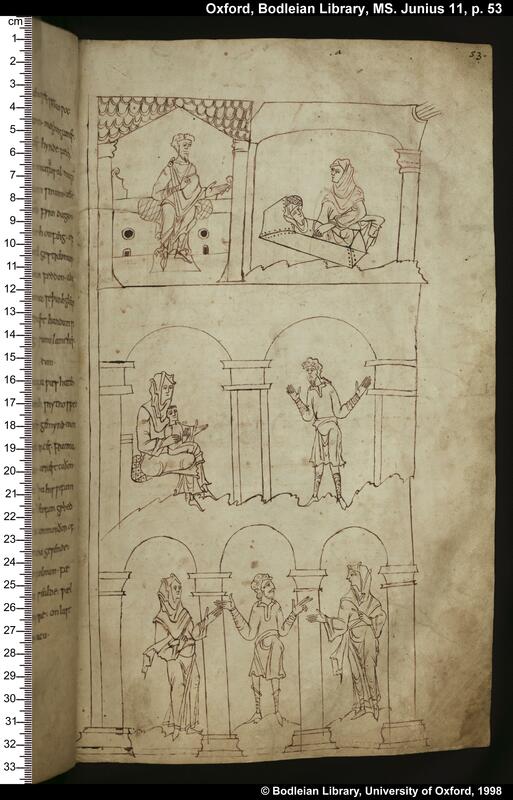 You might also like to admire its design, structure, and observations of, as well as cumulative reflections upon, a remarkable series of manuscripts, texts, and illustrations — medieval and early modern scribbles and doodles included. Reflecting upon the processes of design and choices which led to the publication of the catalogue, and the processes which emerged, in part, from its achievement, we are preparing an Interview with our Font and Layout Designer (Bembino included). Coming soon to a screen near you. We invite you also, on the Pages of this website, to stroll through the the Series of Seminars on the Evidence of Manuscripts, as well as our Congress Activities and other Events over the years since these beginnings, on a mild, clear day in May 1989, of a long-term and dedicated series of collaborative scholarly meetings organized by the Research Group on Manuscript Evidence.